“3 Low 1 High” – Is it referring to low sugar, low salt, low fat and high fiber? If you can only relate this to healthy eating, you may be out-of-date as this is the new term to describe the characteristics of a group of Hong Kong children so-called “Kong Kids”. “Kong kids” refers to those spoiled children who have low self-care ability, low adversity quotient and low emotional quotient (Kwok, 2010). They are usually the products of middle income families with domestic helpers. There are three main causes of “Kong kids” phenomenon: one kid family, academic-oriented nurturance and working parents. According to Census and Statistics Department (2013), the birth rate remained at low level which implied that most of the Hong Kong people had low incentive of having a baby. Therefore, one child family is not uncommon in Hong Kong. With one child, parents and grandparents would spoil the toddler by giving as much as they can. Children just live like a parasite. If they want eat, they open their mouths or shout out to the domestic helpers. Besides, many Hong Kong parents are more focused on the academic achievement of the children because good result always equal to bright prospect. They don’t expect their kids to do anything unrelated to study, not to mention housework (Fung, 2013). Nevertheless, a majority of parents are working parents in Hong Kong which “had the fifth longest average weekly working hours in the world” (Ho, 2011, para.6). As a result, domestic helpers are employed to help with housework as well as take care of the children. Excess care would increase the dependency of children and discourage their growth. Clinical psychologist Daisy Chow (2011) indicated that the number of case in relation to “Kong kids” behaviors increased by 10 percent in past two years. Nearly 80 percent of parents interviewed also said their children were unable to get dressed themselves (Parry, 2013). The problem was getting serious. However, children are our future. They should be able to take care themselves and shoulder the responsibilities toward the society but not act like a “Kong kid”. Implementation of self-care and life skills education, parent role modeling and less intervention maybe the possible ways to rescue the “Kong kids”. First of all, implementing self-care and life skills lesson at school may be one of the possible solutions. Many parents argued that they have no time to accompany their children because of long working hours, not to mention bringing up their self-care and life skills. Therefore, school, the second home of the children, may be an alternative to develop their self-care abilities. Ying Wah Primary school had already participated in it. Principal Lam (2011) said the self-care abilities of children deteriorated in the last few years and that was the reason why she included self-care and life skills in the scope of general studies lesson. During the lesson, students are taught how to tie their shoelace, plait the clothes and sweep the floor etc. Several awards, such as housework master, were also set up to motivate kids to do housekeeping. The result was somehow satisfactory because children always become more confident and willing to do things well once they get other’s approval (KidMatter Early Childhood Team, 2012). Having said so, many people criticized the effectiveness and flexibility of increasing self-care and life skills education at school. Under the exam-oriented education system, students usually have to prepare for the examinations no matter they are in primary or secondary school. Self-care and life skills education would share the time of learning academic content and properly weaken their competitiveness. 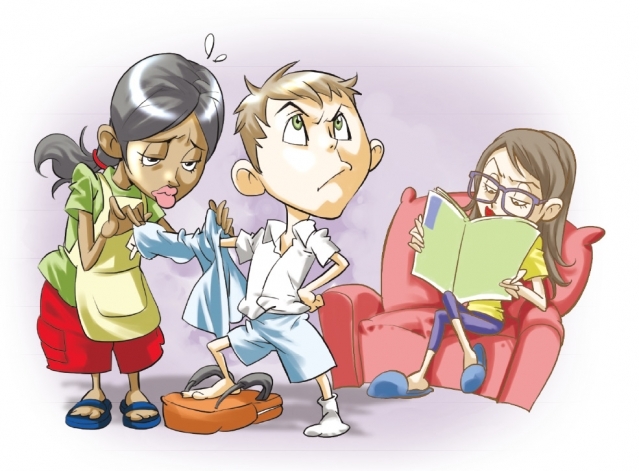 Moreover, majority of Hong Kong parents seldom allow their children to do things around home. Children thus got no chance to practice at home even though they have learned some self-care skills. “Example is better than precept”, a classic saying about parenting, showed the importance of role modeling in child education as copying is a way of learning for kids. Role model can be any “subjects of admiration and emulation. Through their personal qualities and achievements, they can inspire others to strive and develop without direct instruction (Bloom, 2011). Everyone can be child’s role model. However, parents ranked as the top of influential role model in babe’s life. Susan Revermann (2010) concluded few advantages that parents are more powerful than the other role models: (1) Trust; (2) Quantity of Time; (3) You’re Real. For trust, mum and dad were the first two people that child met when they came to the world. They supposed to be two familiar people who can be treated as credible illustration for children. For quantity of time, children generally spent most of the time with their parents than the others. Also, the more the time you accompanied with your children, the higher the influence you made on them. Finally, unlike cartoon characters and pop stars, parents are real and communicative that interaction is not impossible. Although “Seeing is believing, when kids see, they become.” (Stephens, 2004), parent role modeling may not be efficient at all as most of the Hong Kong parents are working parents who can only spend time with their children during holiday. Also, many parents are somehow “Kong kids”. They always demand their domestic helpers from preparing night snacks for them to giving a cup of water when needed. Children are highly influenced by bad modeling as it takes three years to build a good character but three days to corrupt. Even though parents are pleased to change their habits, it may take more than a year. Less intervention allows your kid to have ‘real’ growth. I understood that children are forever children who are lack of abilities and should be well protected in parents’ eyes. Psychologist Marila Fernandes expressed that it is favorable of being protective but cannot overboard. With regard to safety, worrying the kids is natural for parents (as cited in Zuzarte, 2013). I always ask my uncle and aunt. Why don’t you think my 4-year-old cousin have no concept of cold and hot, hungry and full? “No, he should know but we just worry.” They replied. I had no surprise as a lot of “helicopter parents”, a group of parents who are normally the producers of “Kong Kids” and “engage in the practice of over-parenting” (O’Donnell, 2011), were too sensitive and underestimated the abilities of their children. According to the specialist from Heep Hong Society (2011), 3 to 4-year-old children should be able to dress up and eat without assistance while 5 to 6-year-old can tie the shoelace and take a bath (as cited in The Hongkong Federation of Youth Groups, 2013, p.63). Parents are not suggested to provide everything before the kids can ask for it. Beyond being sensitive, many “helicopter parents” also believed that children are incompetence to face challenges as well as dealing with setbacks. In this competitive world, it is inevitable to have discouragement and depression. Parents should notify that they will not always be there to handle every little thing for their children. Therefore, they are suggested to provide guidance instead of helping kids to solve the problems so as to enhance child’s development on independency and resilience, which is an inherent ability that will be stirred only under adversity (as cited in The Hongkong Federation of Youth Groups, 2013, p.89). Also, too much intervention is an act of distrust which properly harms the parent-child relationship. Children would thus not eager to speak up their thought. In short, coping with difficulties is a part of growth. Children will never have ‘real’ growth if you put him/her in the greenhouse. Parents should be tolerable but not coldhearted, for example, they should aid the kids immediately for sure when he/she falls down with serious wound while only encouragement is expected if he/she has no or minor cut. Because of several external and internal factors including one kid family, working parents and academic-oriented nurturance, many Hong Kong children became “Kong kids”. Implementation of self-care and life skills education, parent role modeling and less intervention are the sound strategies while less intervention is the most effective way to rescue the “Kong kids” as it leaves the space for enhancing child’s abilities in particular of those “3 lows”. “Kong kid” was no longer a personal issue. It affects the children’s growth and properly forms a cycle as those “princesses” and “princes” may become the bad model affecting the behaviors of future generation as well as the sustainability and competitiveness of Hong Kong. In order to protect our beloved home, please be responsible and think twice before showing your “love and care” to the kids. 12. The Hongkong Federation of Youth Groups. (2013). New parenting guidance. Hong Kong, HK: The Hongkong Federation of Youth Groups. « Why I so care about my academic result? Hi, Kiki. I am Christy. It is not uncommon that Kong kid don’t know how to take care themselves. Few days ago, when I was walking along the street, I saw a primary student who wears PE uniform, and suddenly she found that one of her shoelace was loosed. But she did not know how to make it back and finally her domestic helper did it for her. I hope there is no more kong kids and no more monster parents!! Why I so care about my academic result?